The Sheldon Chumir Foundation for Ethics in Leadership is hosting a Symposium this fall in Calgary on identity and public policy. The Foundation, formed by a bequest of Mr. Chumir, who firmly believed that ethical values are fundamental to a healthy society. He wished the Foundation to foster ethical actions in the practical world of government, business and community.works on a variety of issues. As of early 2008, the Foundation’s two primary priorities are (1) the reform of Alberta’s human rights (anti-discrimination) law and (2) issues connected with diversity. The work on diversity touches on topics such as free speech in a multicultural society, the appropriate role of religion in Canadian public life and the impact of greater diversity on gender equality in Canada. The Symposium is one effort towards this end, and below is a summary of the event, including a list of speakers and registration information. I have contacted the foundations for information on accessibility, if anyone has any particular requests i would be happy to forward them on your behalf, just send me an email at virtual.jess@gmail.com. Canada is often pointed to as a model of how a highly diverse population can live together peacefully. But our diversity can present challenges. For example, the debate in Ontario a few years ago about giving the force of law to religiously-based arbitration revealed tensions between promoting gender equality and accommodating religious difference. The Chumir Foundation is launching a multi-year project on diversity by looking at a few basic issues: How do we identify ourselves? Why is identity of ethical importance? And what does this all mean for public policy and good governance? Invited speakers include Daniel Weinstock from University of Montreal, Janice Stein from the University of Toronto and Carl James of York University – all of whom are known for their writing and speaking on diversity issues. The keynote speaker Friday evening is Kwame Anthony Appiah from Princeton. Professor Appiah is often said to be one of the leading public intellectuals in the US. His writing on identity and diversity issues includes the books Cosmopolitanism and The Ethics of Identity. 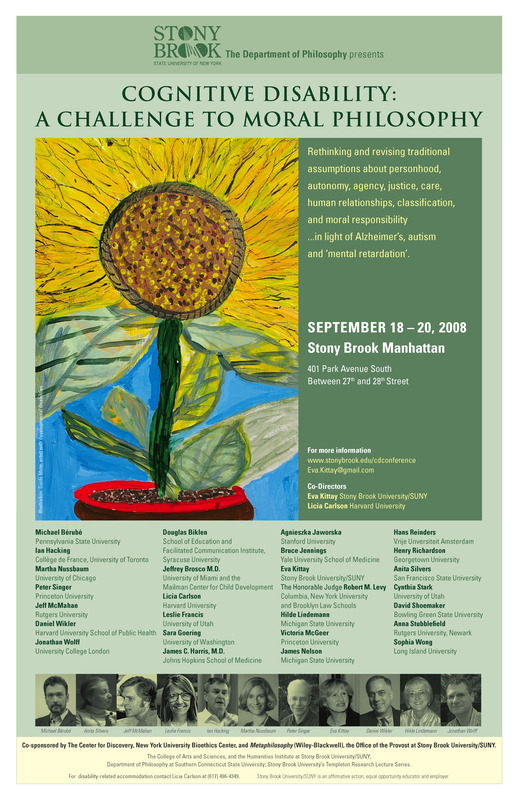 Eva Kittay @ Stony Brook and Licia Carlson @ Harvard are co-directing a conference September 18-20, 2008 at Stony Brook Manhattan: Cognitive Disability: A Challenge to Moral Philosophy. The poster says it all. Except: “Go if you can”. Visit the website for all the juicy details.